Enlighten the public about your brand with ePromos' line of promotional flashlight keychains! They make a fun and practical way to promote your business and will help you in your search for new customers. Keep your company at the forefront of their minds every time they reach for their keys. ePromos is here to shed light on new marketing opportunities, and practical personalized flashlight keychains are a great tool to pass out at your next trade show, event, or marketing campaign. These soft rubberized plastic keylight customized keychains will light up your upcoming promos! This popular Rectangle LED Light Promotional Key Tag is 6 bright colors all with silver trim. This custom key tag is bright, long lasting, energy efficient and the LED bulb shines bright white. Environmental friendly promotional key light multi-function crank flashlight. Lightweight and durable Aluminum LED Promotional Keychain with built-in flashlight. A variety of translucent colors are available with this budget-friendly customized flashlight and convenient key ring. This custom flashlight keychain with bright white LED will be your star giveaway at your next event. Convenient LED key light is perfect for when you are stuck in the dark. The Mini Custom Key Light is a small, but powerful source of light that can also hold all of your keys. Perfect size to keep on your gym bag, purse or backpack! A handy little logo flashlight that you can clip anywhere. Slim and lightweight logo keychain with bright white light at the push of a button. A classy soft-to-the-touch leatherette promotional keychain with light. This Daylighter LED light promotional key tag features a bright flashlight in a miniature size for your keychain. This rectangle LED light promotional key tags is one of the most popular keylights in the world. Rubber promotional bottle opener and keychain includes L.E.D. light. 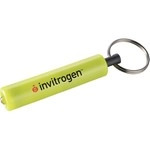 Promotional keychain with attached super bright LED lasts over 23 hours. Shine light on your logo with this bright LED Magnetic Custom Flashlight w/ Bottle Opener! It's slim design means it will fit so easily into purses, backpacks, and pockets. A slim and compact Customized keylight that is perfect for finding keys and door knobs in dark places. Make quick fixes even in dimly lit places with this useful promotional multi-tool flashlight keychain. Tackle even small jobs with no sweat using this logo screwdriver with built-in flashlight. Keep customers out of the dark about your company with ePromos' line of promotional keychain flashlights. These useful and memorable accessories make great gifts to help get your next marketing campaign off the ground. Since they're so budget-friendly, buy in bulk if you're looking to hand out at your next well-attended trade show or expo. With a variety of customization options from color, style, size, and shape, your logo is guaranteed to look sleek for your next promotional campaign. Utilize one of the easiest and most effective ways to raise brand awareness – browse our selection today and get in touch to find out more!